Extensive changes made in Boks team - SABC News - Breaking news, special reports, world, business, sport coverage of all South African current events. Africa's news leader. The Springbok coach also made several positional changes to the match day squad that lost to Ireland in Dublin last weekend. 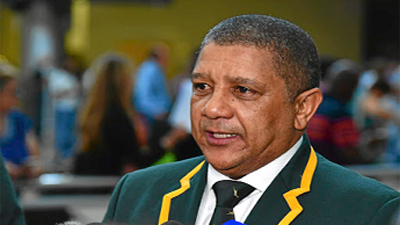 As expected, Springbok Coach Allister Coetzee has made extensive changes to the Springbok team for Saturday’s test against France in Paris. He has made 10 changes to the match day 23, with recalls in the starting line-up for No 8 Duane Vermeulen and flyhalf Handré Pollard. Coetzee also handed a first Test start to prop Wilco Louw, while Francois Venter has been selected at inside centre. Elton Jantjies and Damian De Allende are included amongst the replacements, where they will be joined by prop forward Trevor Nyakane and uncapped loose forward Dan du Preez. If he plays, Robert du Preez senior will become the first Springbok to have two sons also capped at international level for South Africa. This entry was posted on 16 Nov 2017,04:08PM at 4:08 PM and is filed under Sport, Rugby, Homepage Latest Stories Slider. You can follow any responses to this entry through the RSS 2.0 feed. Both comments and pings are currently closed.